Salt Water Cures is possibly one of the most vital and powerful cures that has been extremely well guarded secret by Feng Shui Masters for thousands of years .These days, the salt water cure is very common as it has been copied by many although you need to be careful that you are in fact getting the right formula and information on using this cure in the correct way. The salt water cure is of the most important Feng Shui remedy in the Flying Star system that is used to neutralize the negative effects of unfavorable flying stars in certain areas of your home or workplace. These ill-fated stars move each year, so Feng Shui practitioners recommend an annual salt water cure. 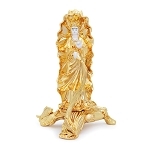 Considered as a Metal cure as, the metal element is represented in this remedy using metal Chinese coins, the salt water cure combines the purifying effects of salt and water and the chemical reaction between metal and salt. It is traditionally used to suppress the negative yellow and black earth energy of the misfortune star #5 and the illness star # 2. However, some practitioners also use it to “reduce” the wood of the argumentative wood star# 3. In the five elements cycles, Metal weakens the Earth and controls wood. If you notice that one of these unfavorable stars (5, 3 or 2) is in your mouth of Chi ( Main door) bedroom, living room, or in your kitchen, you might consider to add a salt cure to diminish the negative energy brought by these stars. However, if you see that they occupy a room that you seldom or almost never use like storage area, garage, bathroom you do not necessarily need to have one in these sectors. Why do we use 6 coins? The number 6 represents the QIAN trigram, the metal element that is necessary to submit the afflicted Earth energy of the stars # 5 and # 2. Place the 6 coins on top of the salt. Traditionally, I Ching coins are used, place them on the salt with the Yang side visible ( the yang side is the one with the 4 Chinese characters), so that the Yin side (which has only two ) touches the surface of the salt. Fill the water container to the edge. Place the container on the plate or on the stand and put this set into the sector occupied by the annual flying star # 5 in the southwest this year, will activate accidents and misfortune and the #2 in the northeast will activate sickness. Do not cover the container and do not put it inside a cabinet, because the salt-water-coins mixture must meet the ambient air to create “salt crystals”. In order to avoid capsizing your cure, you should prefer an area where there is not excessively movement, like the corner of the room, for example. The cure should not necessarily be visible for it to work, so you can very well put it behind a plant or the couch, provided it is not enclosed in a cabinet. When placing your salt water cure, take into consideration that you should be able to have easy access to your cure in order to add water as needed. As a rule, we add another metal object right next to the salt water cure , metal Wu lou, 6 coins metal ruler etc., in combos like #2# 5 or # 5 and 1 to get the best result possible. Once set up, avoid moving it around. Please note that the salt water cure is NOT the same as the salt lamps those are not connected with the salt water cure. As the salt cure will absorb and accumulate a lot of negative Chi (energy), the appearance of the salt cure may change as time passes. The more you see salt crystals overflowing the container, the more you know that the cure is doing its job of reducing the negative energies. So be careful when you want to replace it. Do not attempt to retrieve the container or coins for a second use. After the year is done dispose it all away. When disposing of a Salt Water Cure, be very careful and dispose of it in an old Tupperware container or in a thick bag that will not leak. The best place to dispose of a Salt Water Cure is to place it in a sealed waste bin. You can set up a Salt Water Cure at any time of the year. 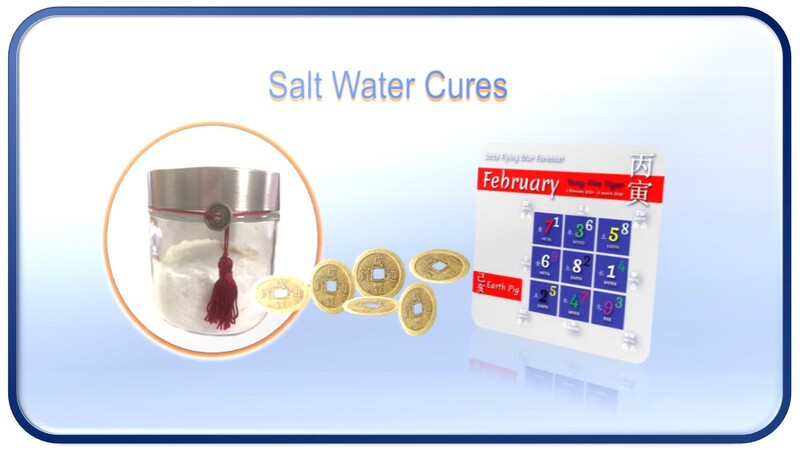 Traditionally, around Chinese New Year (solar new year, so around February 4th) is always a good time to start a new salt water cure or to replace the old one. How many times a year you change your Salt Water Cure depends on how quick the cure forms crystals and when they get to a point where you can no longer manage them. In some extreme cases, the cure must be replaced every few months.